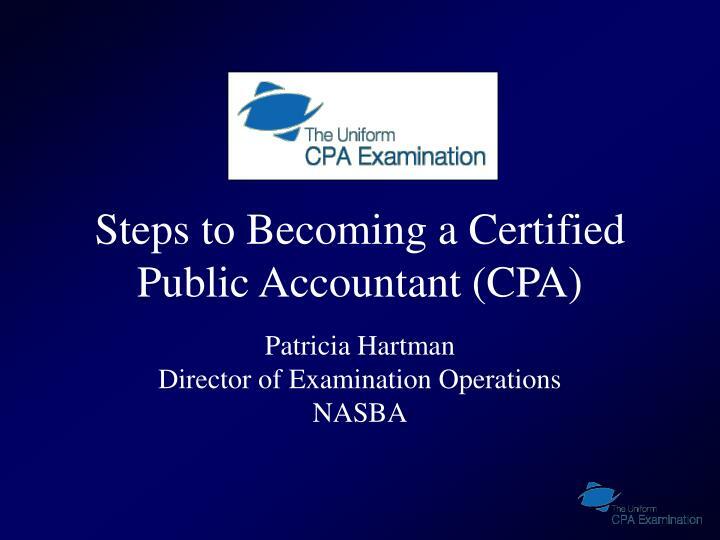 Steps to Becoming a Certified Public Accountant (CPA) Patricia Hartman Director of Examination Operations NASBA The Credential - CPA CPA is a credential conferred by a state or similar governmental jurisdiction that authorized the holder to practice as a a CPA in that jurisdiction. 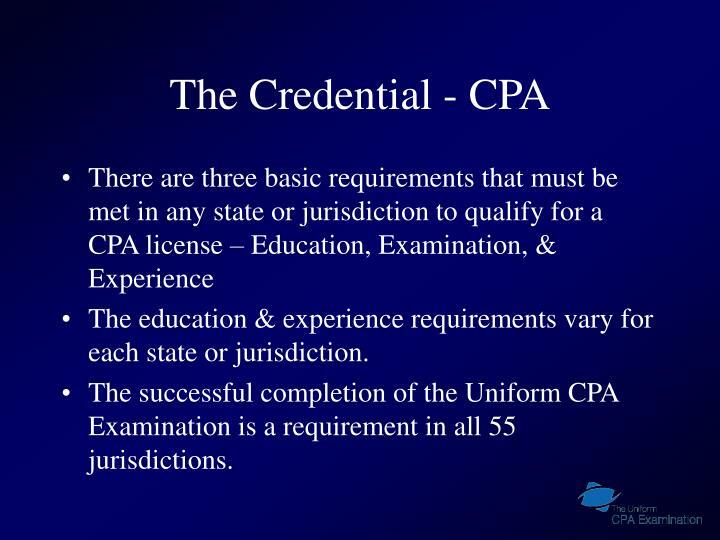 CPA is a credential conferred by a state or similar governmental jurisdiction that authorized the holder to practice as a a CPA in that jurisdiction. 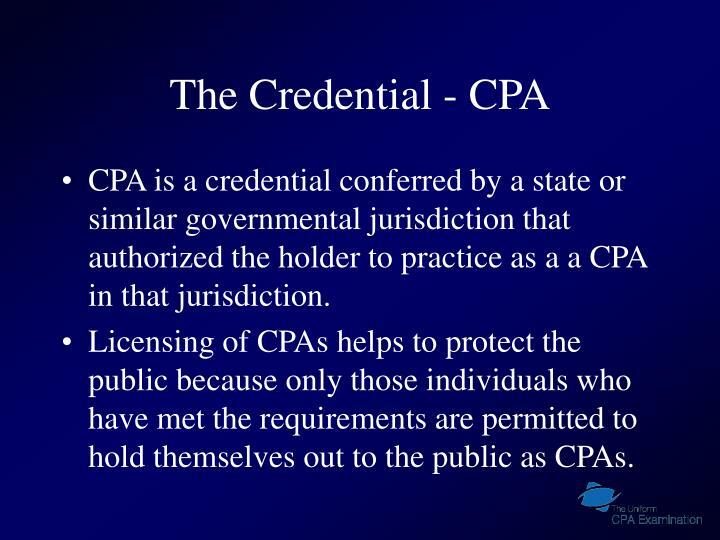 Licensing of CPAs helps to protect the public because only those individuals who have met the requirements are permitted to hold themselves out to the public as CPAs. 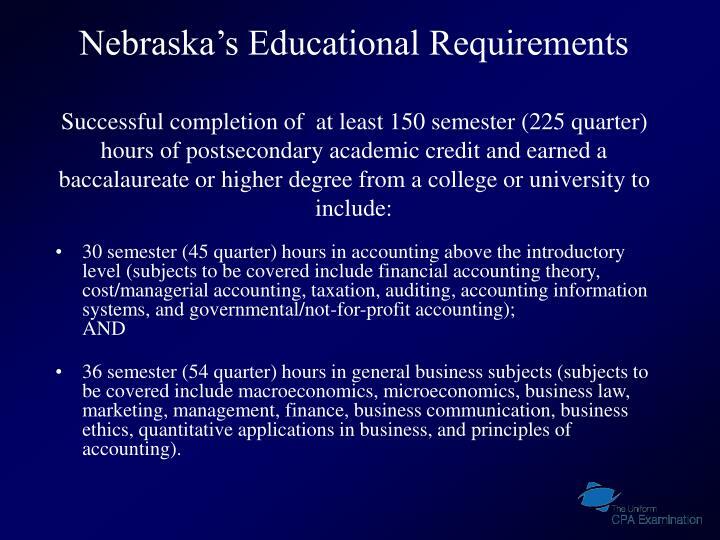 The education & experience requirements vary for each state or jurisdiction. 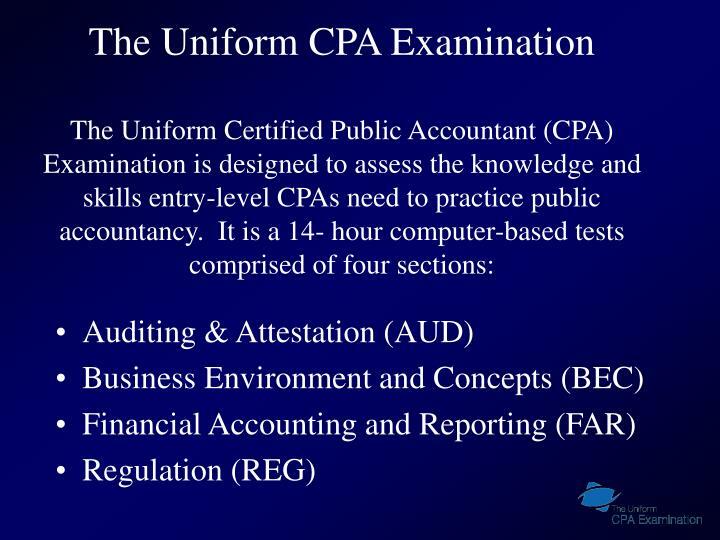 The successful completion of the Uniform CPA Examination is a requirement in all 55 jurisdictions. 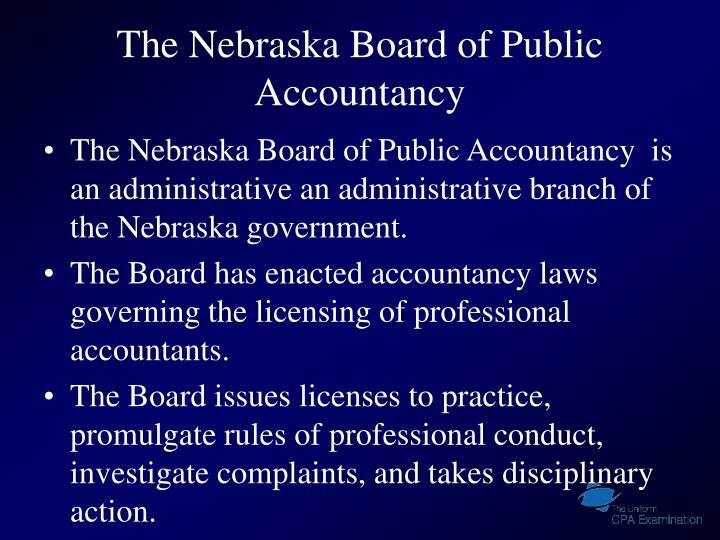 The Nebraska Board of Public Accountancy is an administrative an administrative branch of the Nebraska government. The Board has enacted accountancy laws governing the licensing of professional accountants. The Board issues licenses to practice, promulgate rules of professional conduct, investigate complaints, and takes disciplinary action. 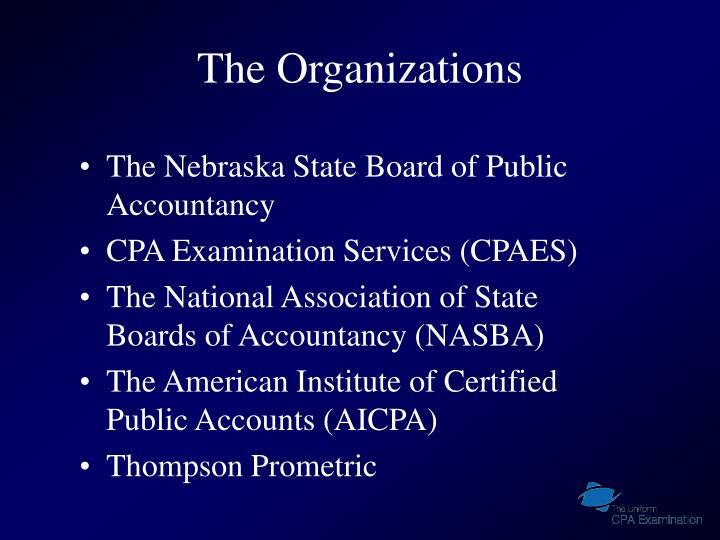 CPAES is a division of NASBA that does application processing, credential evaluation, examination administration and score reporting for several of the Boards of Accountancy. 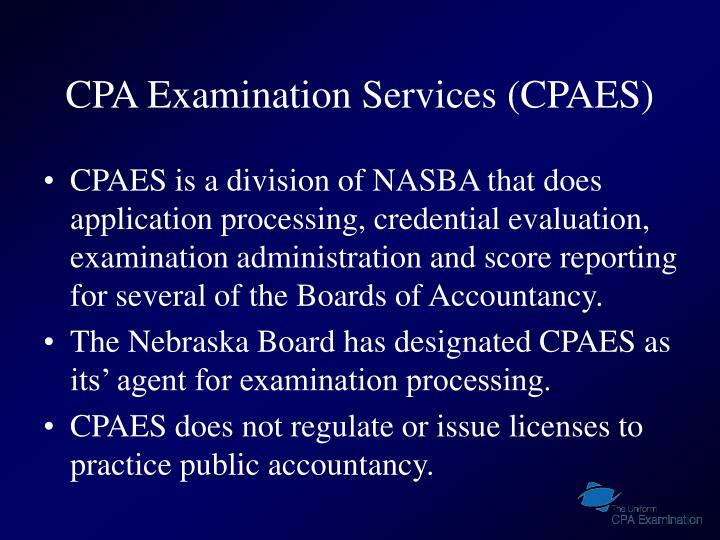 The Nebraska Board has designated CPAES as its’ agent for examination processing. CPAES does not regulate or issue licenses to practice public accountancy. NASBA serves as a forum for its 55 member boards of accountancy in the U.S. and its’ jurisdictions. 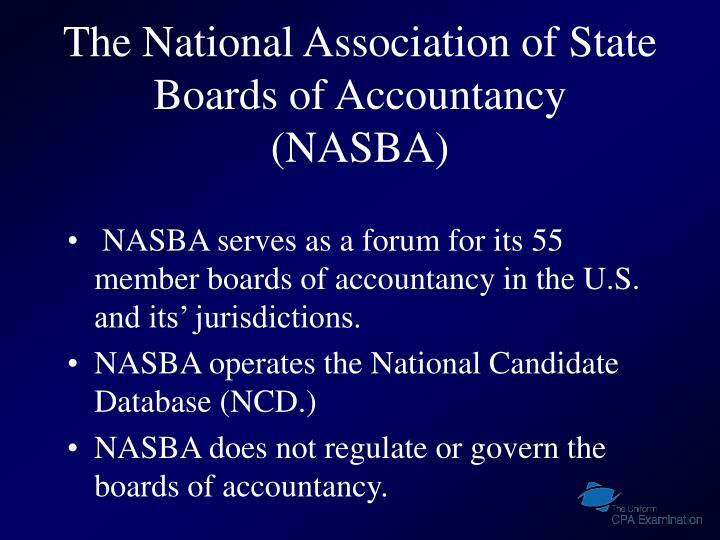 NASBA does not regulate or govern the boards of accountancy. 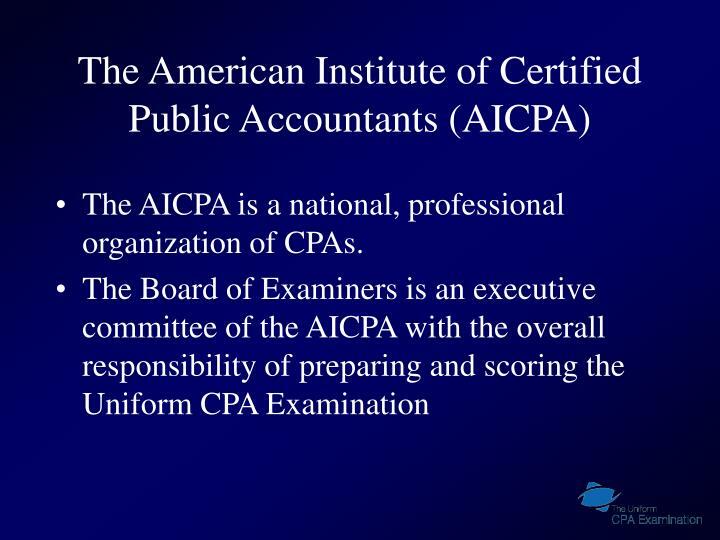 The AICPA is a national, professional organization of CPAs. 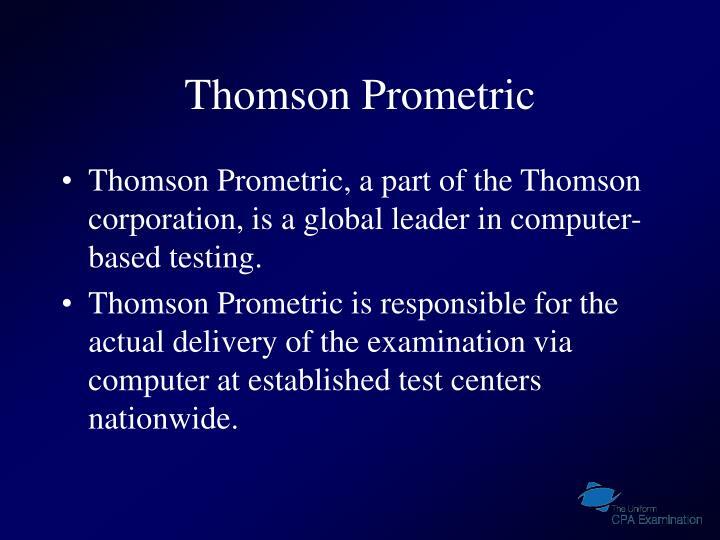 Thomson Prometric, a part of the Thomson corporation, is a global leader in computer-based testing. Thomson Prometric is responsible for the actual delivery of the examination via computer at established test centers nationwide. Decide where you want to be licensed. Review the Uniform CPA Candidate Bulletin. Visit www.cpa-exam.org and take the tutorial and sample tests. 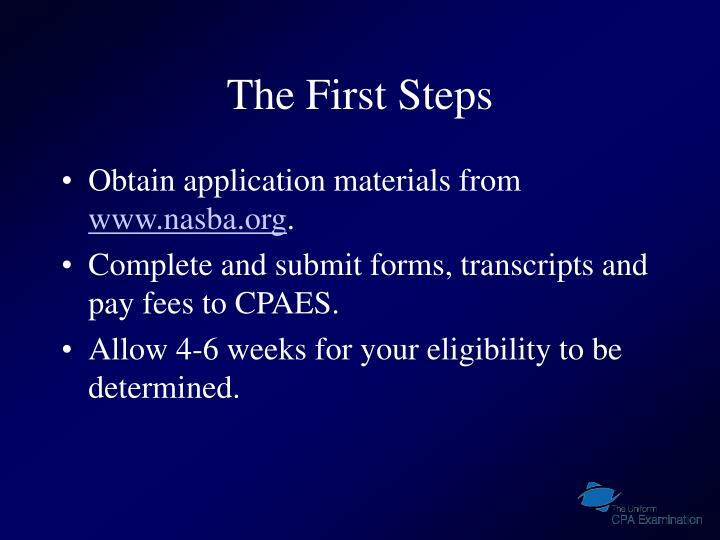 Obtain application materials from www.nasba.org. Complete and submit forms, transcripts and pay fees to CPAES. Allow 4-6 weeks for your eligibility to be determined. If there are any discrepancies in your application materials, CPAES will notify you via email, telephone or U. S. mail. 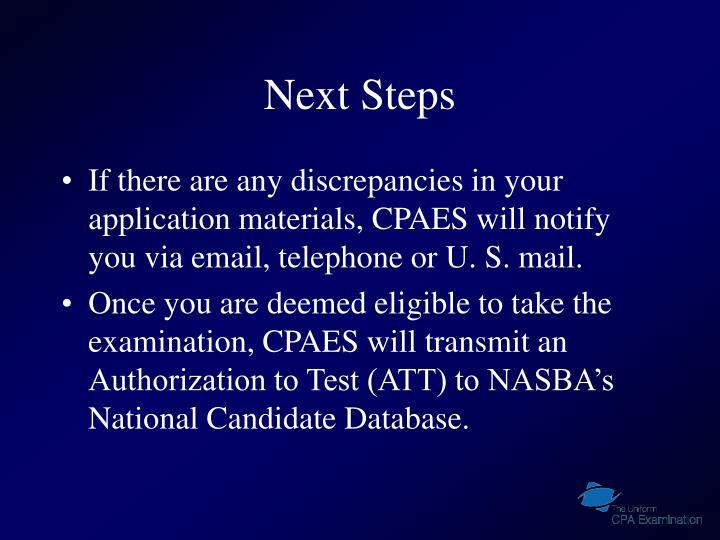 Once you are deemed eligible to take the examination, CPAES will transmit an Authorization to Test (ATT) to NASBA’s National Candidate Database. The information in the ATT will be cross referenced against all candidate records in the nation to ensure that candidates are not applying in multiple jurisdictions. 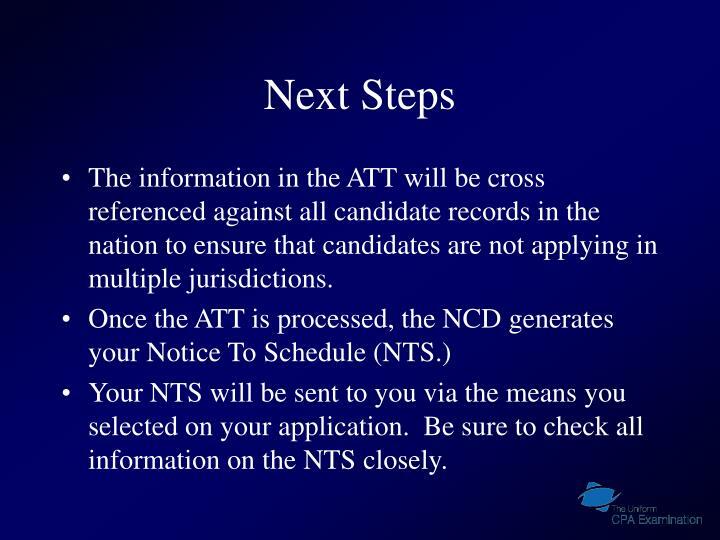 Your NTS will be sent to you via the means you selected on your application. Be sure to check all information on the NTS closely. 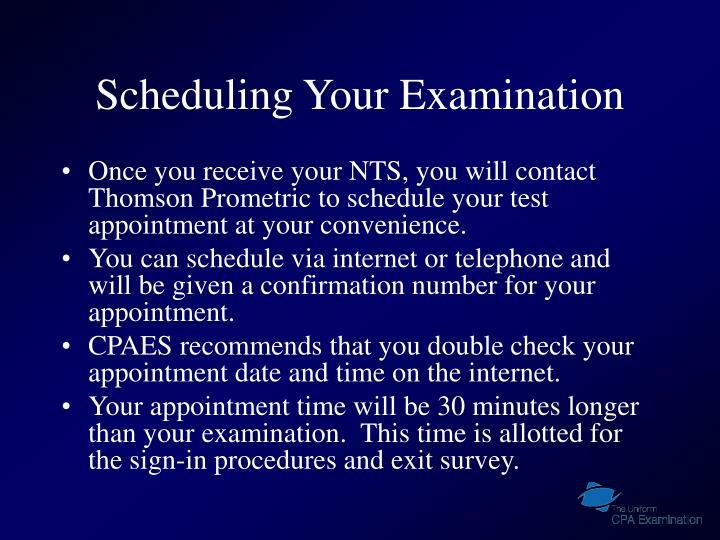 Once you receive your NTS, you will contact Thomson Prometric to schedule your test appointment at your convenience. You can schedule via internet or telephone and will be given a confirmation number for your appointment. CPAES recommends that you double check your appointment date and time on the internet. Your appointment time will be 30 minutes longer than your examination. This time is allotted for the sign-in procedures and exit survey. 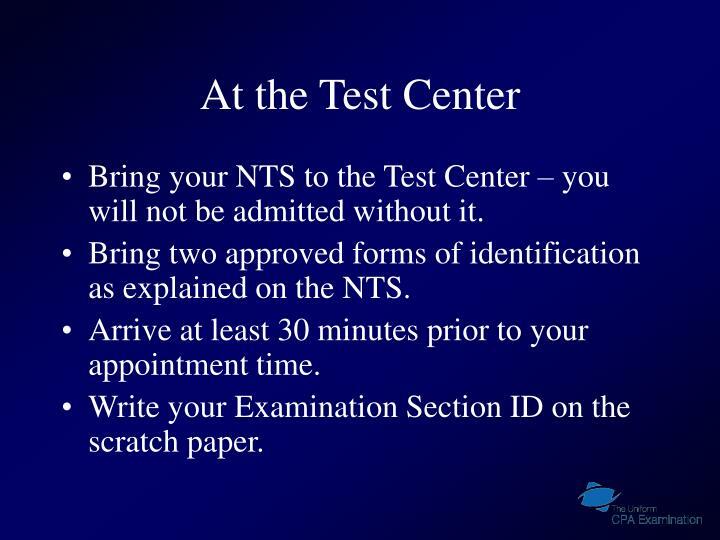 Bring your NTS to the Test Center – you will not be admitted without it. Bring two approved forms of identification as explained on the NTS. Arrive at least 30 minutes prior to your appointment time. Write your Examination Section ID on the scratch paper. Once you are seated at a workstation, you will have a limited amount of time to enter your examination password. Once the examination is launched, you will have a limited amount of time to read through the introductory screens. Do not use this time to write notes or reminders on your scratch paper. 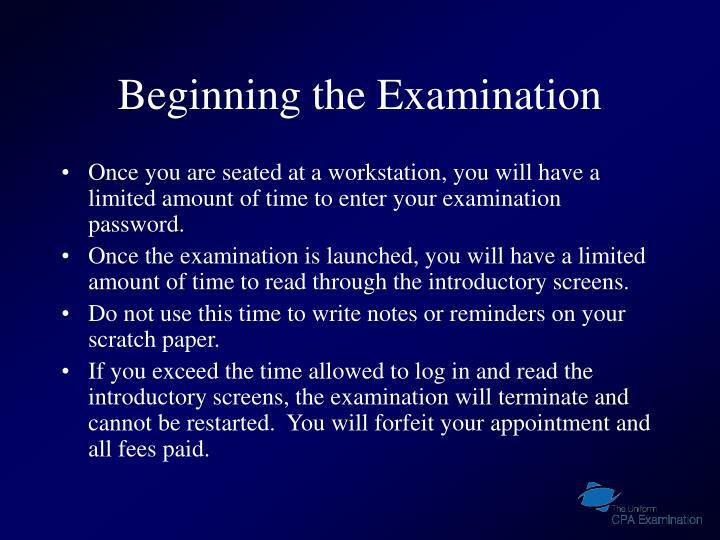 If you exceed the time allowed to log in and read the introductory screens, the examination will terminate and cannot be restarted. You will forfeit your appointment and all fees paid. Be sure to read and follow directions closely. Report any problems to the Test Center Administrator (TCA). 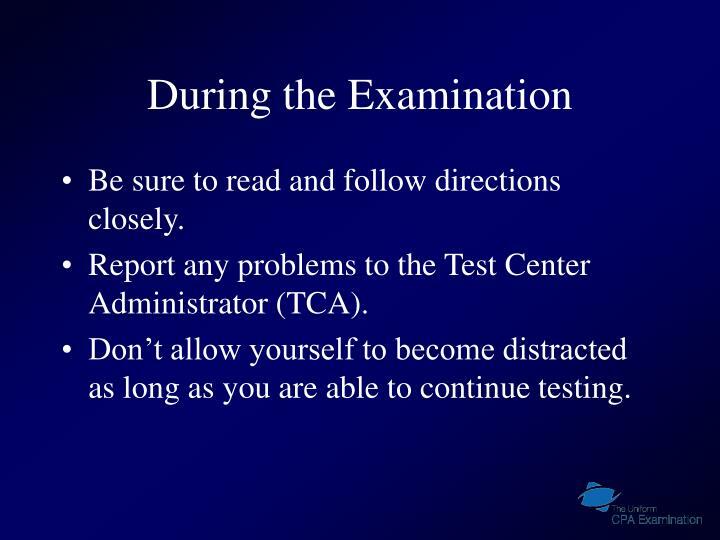 Don’t allow yourself to become distracted as long as you are able to continue testing. The examination consists of several sections or testlets. You will be able to review questions in any testlet but you will not be able to go back to a testlet once you have exited from it. You may take a break between testlets, however, your examination time is still running, so use your time wisely. The examination is timed, so if you exhaust all available time, you will be presented with a warning that your time has expired. 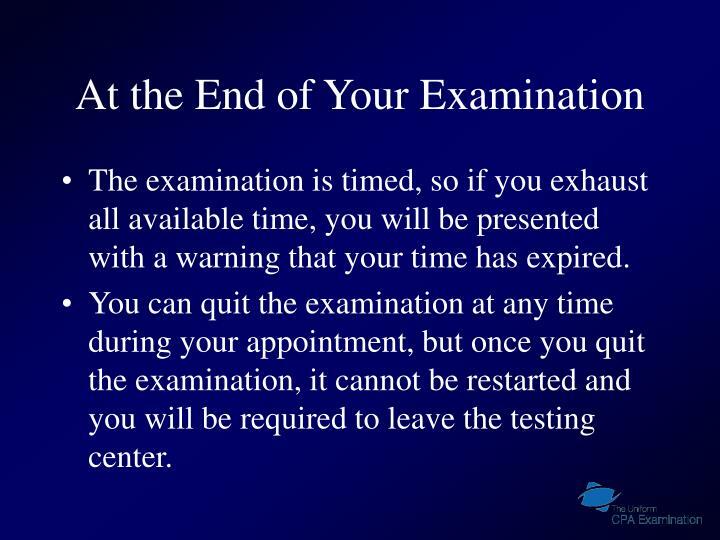 You can quit the examination at any time during your appointment, but once you quit the examination, it cannot be restarted and you will be required to leave the testing center. 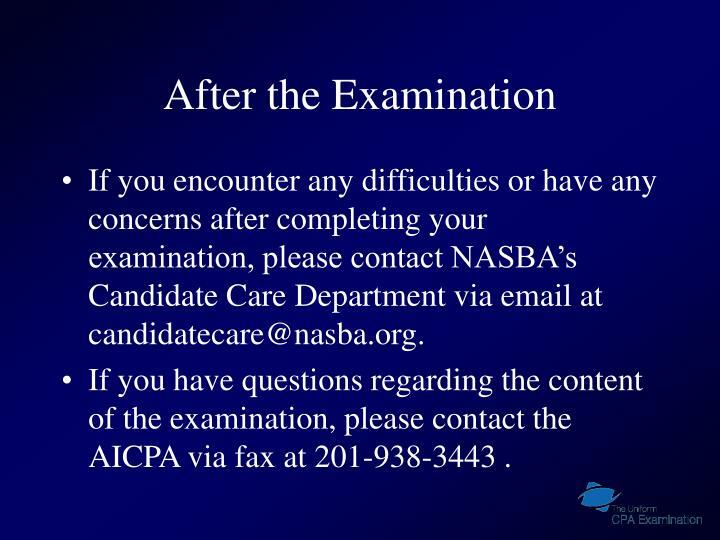 If you encounter any difficulties or have any concerns after completing your examination, please contact NASBA’s Candidate Care Department via email at candidatecare@nasba.org. 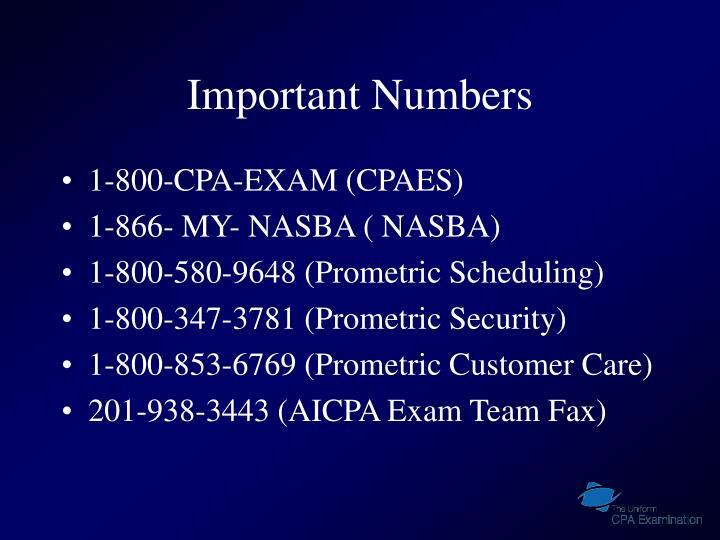 If you have questions regarding the content of the examination, please contact the AICPA via fax at 201-938-3443 . At the end of your testing event, Prometric will transmit your result file to the AICPA for scoring. The AICPA will then score your examination and release the advisory score to NASBA. 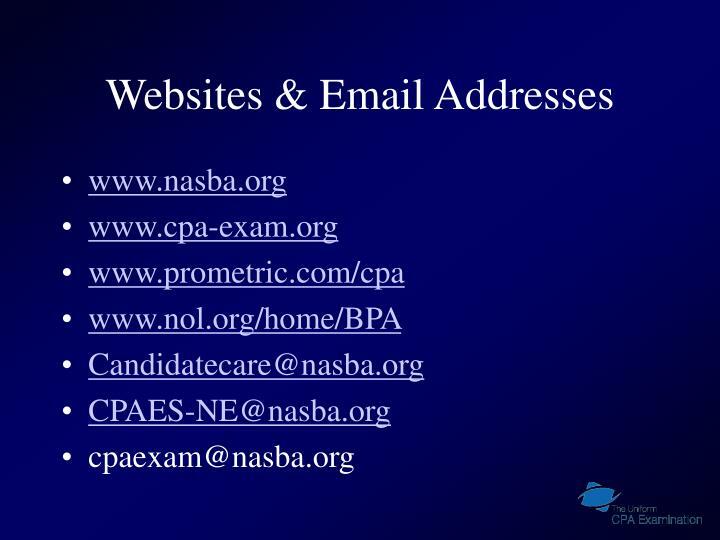 NASBA will match your score to your candidate record, generate a score notice and forward that information to CPAES. 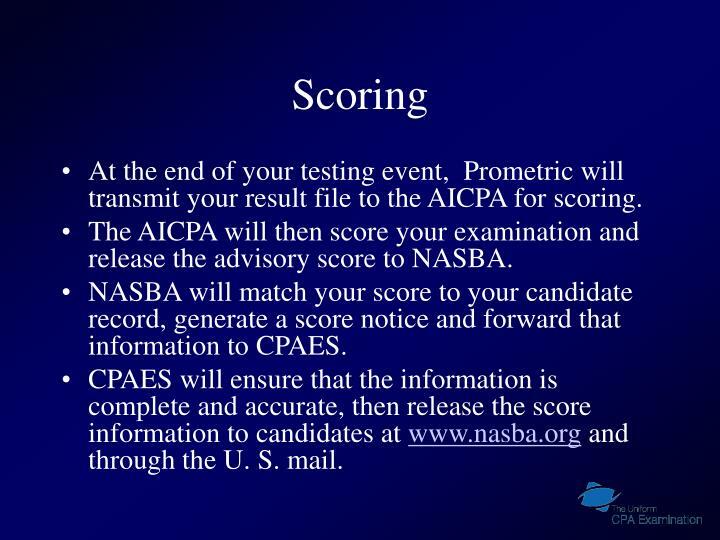 CPAES will ensure that the information is complete and accurate, then release the score information to candidates at www.nasba.org and through the U. S. mail. Once your eligibility for the examination has been determined and you have been issued an NTS, you will be able to register for additional sections via telephone or internet. As a Reexamination candidate, you will not be required to submit an application or transcripts. 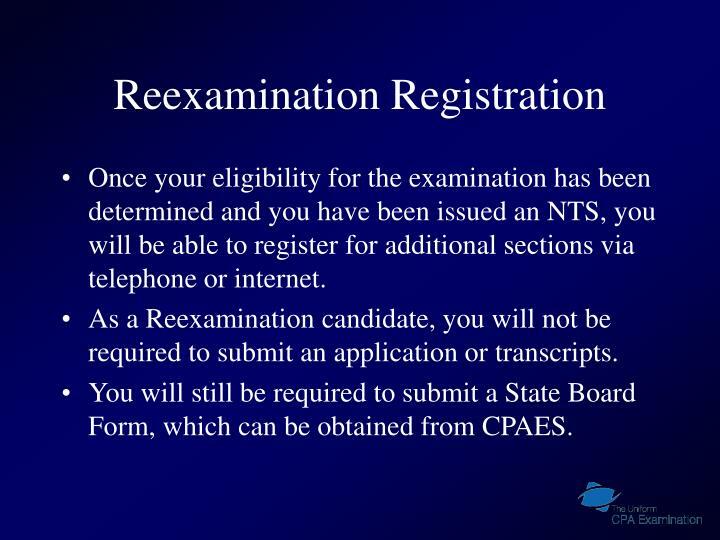 You will still be required to submit a State Board Form, which can be obtained from CPAES. If you received a failing score and wish to retake that section or if you want to take additional sections of the exam, you will need to register as a reexamination candidate. 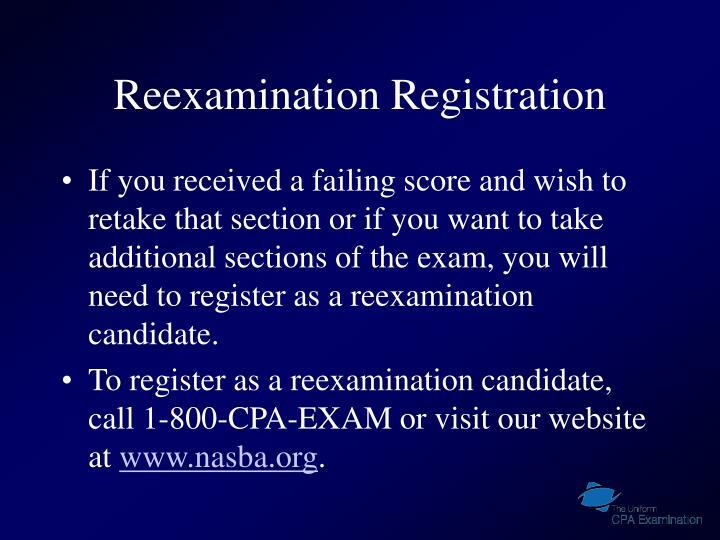 To register as a reexamination candidate, call 1-800-CPA-EXAM or visit our website at www.nasba.org. Once you have successfully completed the CPA Examination, you will be sent a letter regarding further steps in the process to become a CPA. 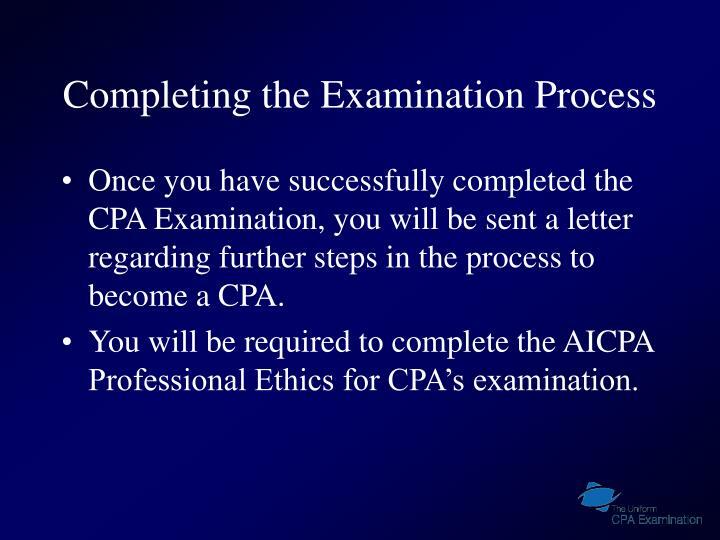 You will be required to complete the AICPA Professional Ethics for CPA’s examination. The AICPA releases Advisory Scores. 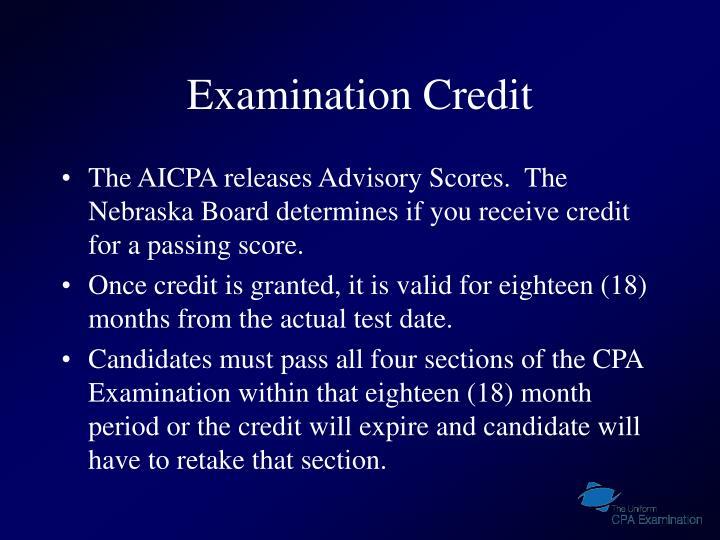 The Nebraska Board determines if you receive credit for a passing score. Once credit is granted, it is valid for eighteen (18) months from the actual test date. Candidates must pass all four sections of the CPA Examination within that eighteen (18) month period or the credit will expire and candidate will have to retake that section. 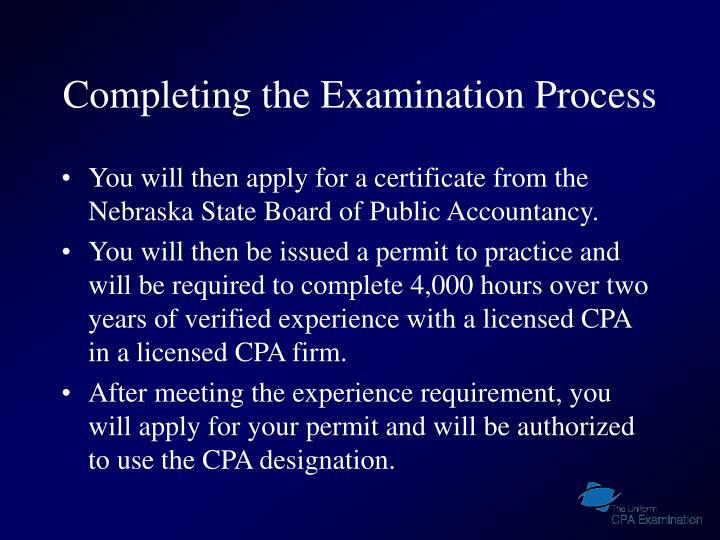 You will then apply for a certificate from the Nebraska State Board of Public Accountancy. You will then be issued a permit to practice and will be required to complete 4,000 hours over two years of verified experience with a licensed CPA in a licensed CPA firm. 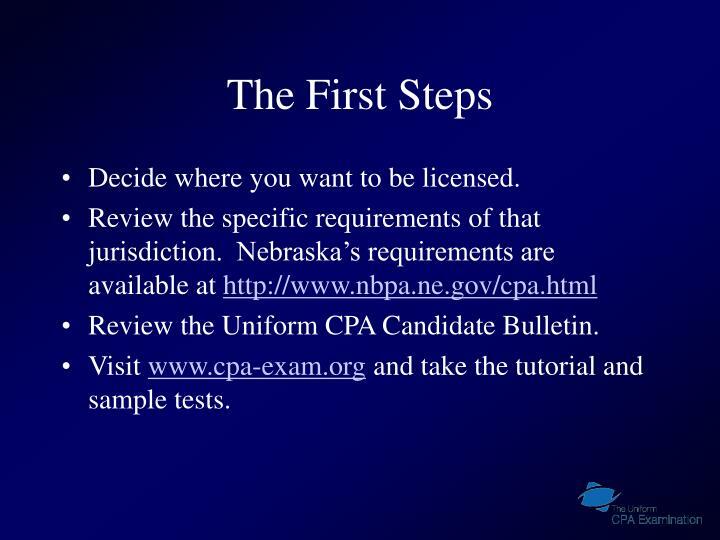 After meeting the experience requirement, you will apply for your permit and will be authorized to use the CPA designation. 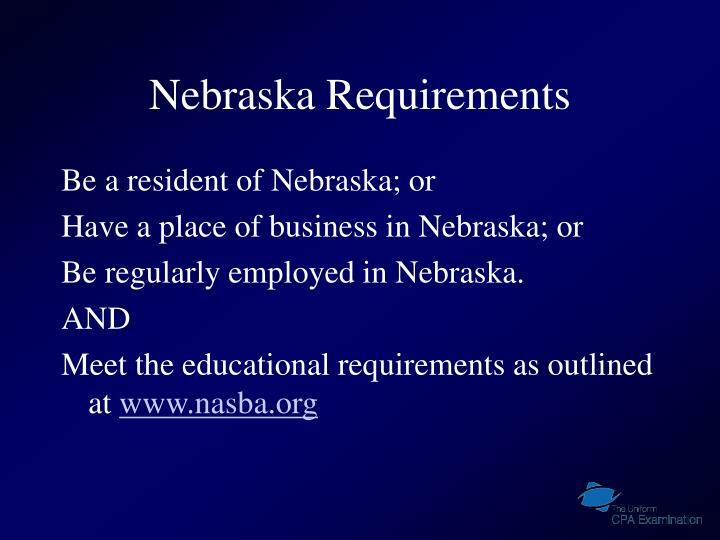 Be regularly employed in Nebraska. 36 semester (54 quarter) hours in general business subjects (subjects to be covered include macroeconomics, microeconomics, business law, marketing, management, finance, business communication, business ethics, quantitative applications in business, and principles of accounting). 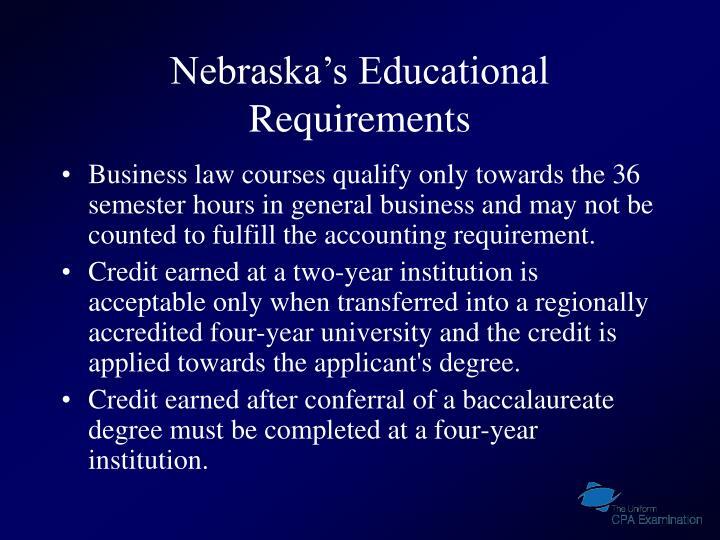 Business law courses qualify only towards the 36 semester hours in general business and may not be counted to fulfill the accounting requirement. Credit earned at a two-year institution is acceptable only when transferred into a regionally accredited four-year university and the credit is applied towards the applicant's degree. Credit earned after conferral of a baccalaureate degree must be completed at a four-year institution.